Hot Topic – what do you think about the X-Men franchise? 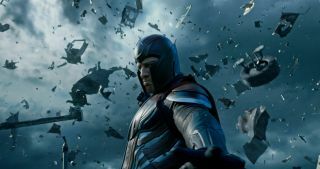 The latest movie in the X-Men franchise, Apocalypse, has just opened. Seen it yet? If you have, or if you are seeing it over the weekend, we want to know what you thought! For the Hot Topic in SFX 276 (on sale 22 June), where readers discuss the biggest issues in sci-fi at the moment, we’re focusing on your reaction to the new X-Men movie. Most critics have been sniffy but are they right? Also, what kind of future do you think the X franchise has? Which characters deserve future outings (solo and group), and which ones should be quietly retired? With new movies on their way, and a TV series, Legion, can it be that Fox has a movie universe to rival Marvel’s? Or is it just too darn complicated?! And looking at the X franchise as a whole, what are the movies that worked and the ones that didn’t? Who’s the better Professor Xavier, Patrick Stewart or James McAvoy? Has the franchise been faithful enough to the comics? Do you count Deadpool as a proper X-Men film? Is Wolverine’s retirement overdue? And (just one more question, honest) should the X-Men go out to play in the MCU? We want to hear your opinions NOW! We'll pick the best comments to appear in the letters pages of the world's number one science fiction magazine. Post in the comment thread below, or email us at sfx@futurenet.com, using the subject line “HOT TOPIC: X-Men”. You can also tweet us at @sfxmagazine, using the hashtag #sfxhottopic, or join us on Facebook. You don’t just have to write to us about X-Men, of course. Give us your thoughts on anything from the exciting and varied worlds of sci-fi and fantasy. What did you think of Captain America: Civil War – as good as many claimed? What about the new series of Game of Thrones – has it rediscovered its form? How do you think Pearl Mackie will shape up as the Doctor’s new companion, Bill? What other movies and TV shows have you been watching lately? Or maybe you’ve just got a comment to make about the latest issue of SFX? Tell us now!